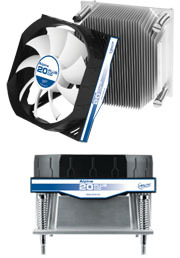 ARCTIC proudly announces the Alpine 20 PLUS CO, a low profile CPU cooler dedicated to Intel LGA-2011 socket. It uses a high quality dual ball bearing from Japan to offer a lifespan up to 5 times longer than common sleeve bearing types. 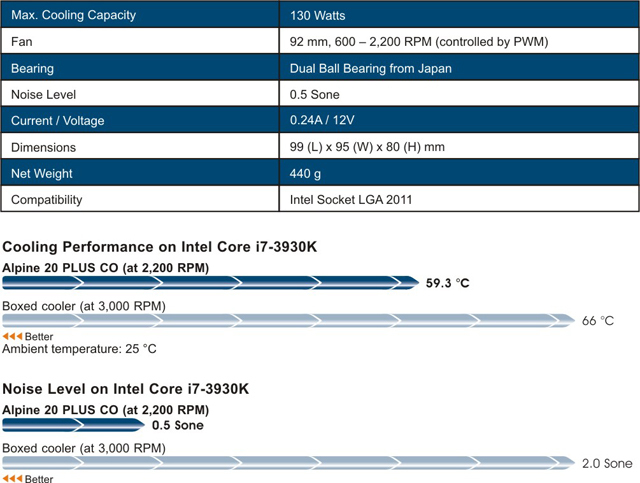 This low profile yet long-lasting CPU cooler is no doubt an excellent cooling solution for entry level servers. Equipped with a 92 mm PWM fan with low noise impeller, the Alpine 20 PLUS CO offers a decent boost of cooling performance and lowers the noise level significantly compared to the box cooler. Thanks to the PWM control, it adjusts the fan speed according to the CPU temperature and thus the noise is always maintained at an absolute minimum. The pre-installed spring-loaded screws guarantee hassle-free setup and ensure optimized contact pressure. Further we save you one installation step with the pre-applied award-winning MX-4 thermal compound which enhances the heat dissipation from the CPU. The Alpine 20 PLUS CO comes with a six-year limited warranty and the MSRP is EUR14.50, excluding VAT. It is now available for purchase on ,i bertronica.es , TNTrade, amazon.co.uk, ebuyer , amazon.fr, komputronik.pl , wesellcd.com and ARCTIC’s Web shop .